Dinesh Kashyap, the incumbent from the Bharatiya Janata Party, is expected to narrowly defeat Deepak “Bunty” Karma, his closest contender from the Congress. Yet, all the attention is focused on the AAP candidate, Sori, a 39-year-old Adivasi school teacher, with Rs 1 lakh in fixed deposits and no assets, who has become a symbol of the tragic repercussions of the war between the Maoists and the state. In October 2011, Sori was arrested for allegedly ferrying money from Essar Group to the Maoists in a deal to protect the company’s assets in rebel-controlled territories. The allegation was denied by Essar Group, Sori and the Maoists. She fled Chhattisgarh, alleging the state police had tried to kill her in a fake encounter, was subsequently arrested in Delhi and transferred back to a prison in Chhattisgarh. In letters smuggled out of prison, Sori accused the police of torturing her in the course of interrogations, and went on a hunger strike in prison to protest against the poor living conditions there and the alleged withholding of medical assistance by prison staff. A medical report by the NRS Medical College in Kolkata lends credence to some of her claims. The Chhattisgarh police has denied Sori’s allegations. On Republic Day in 2012, Ankit Garg, a policeman who allegedly oversaw her torture, was awarded the Police Medal for Gallantry for his bravery in anti-Maoist operations. Garg has also denied Sori’s claims. 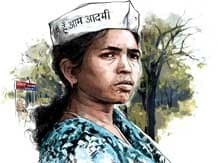 In February this year, nearly two-and-a-half years after her arrest, Sori was granted bail by the Supreme Court and was declared the AAP’s Lok Sabha candidate from Bastar in March. Prior to Sori’s candidature, the Communist Party of India was the only political force that consistently spoke of human rights violations in Chhattisgarh. In 2007, CPI leaders Manish Kunjam and Kartam Joga filed a writ petition in the Supreme Court to halt the controversial Salva Judum movement in which adivasis Adivasis in Chhattisgarh were evacuated from their villages and put in fortified camps protected by the State police. The petitioners have accused Judum mobs of burning villages, attacking villagers and molesting women. Since then, the CPI’s ground network has crumbled under a sustained assault from the Maoist and the state police. Kartam Joga himself was accused of supporting the Maoists and arrested in 2010. He was acquitted in January 2013. It will be a miracle if Sori wins this election. Bastar is an enormous and inaccessible tract of sal forests and iron-veined hills threaded by walking trails, and the Maoist boycott forced all campaigning on to the state and national highways rather than the interior villages that might be more receptive to her key messages. The BJP has thrown its weight behind their candidate – the party’s prime ministerial candidate, Narendra Modi, addressed a rally here in March and Chief Minister Raman Singh flew down this week to rally the troops. Soni’s campaign, by contrast, consists of 15 cars criss-crossing an area the size of Kerala. Campaign posters arrived four days before polling day and her campaign teams have been plagued by requests for money. Sori’s ancestral village of Palnar, on the edge of the forest 15 minutes by car from the Kuakonda police station, is one place teeming with posters of Sori’s sombre countenance alongside AAP convenor Arvind Kejriwal’s beaming visage. Madru Ram, Sori’s father, and Ashu, her youngest child, wait for Sori on a low wooden bed in the airy veranda of their house at the entrance to the settlement. In June 2011, the Maoists attacked Madru Ram’s house in Bade Bidme, a neighbouring village, and shot him through the leg. The fracture is yet to heal. In 2010, a Maoist party attacked the Kuakonda police station and raided the house of Congressman and civil contractor Avadesh Gautam. Gautam escaped but two people were killed and a stray bullet injured his young son. In an FIR recorded after the incident, Gautam said he recognised 67 people who participated in the attack, including Sori and her husband Anil Futani. Futani was arrested straight away and Sori was declared an absconder despite the fact that she continued to teach at her village school a few kilometres away and the school administration faithfully recorded her daily attendance. The police, Sori alleges, would occasionally call her, remind her of the vulnerability of her children and her pending warrant and threaten to arrest her if she did not work for them as an informant. The Avdesh Gautam case collapsed in 2013 – every single accused was acquitted, including Futani who, Sori said, was beaten to the point of partial paralysis. He died soon after. Sori and her small team of volunteers have assembled a 21-point manifesto for a campaign, many of which allude to her party’s focus on decentralisation and devolution of powers and elimination of corruption. Yet in her speeches, Sori talks of her “natural battle” for the truth, for security, for the dignity of Adivasis and the rights of prisoners and undertrials – many of whom, she says, have been jailed on trumped up charges. Nowhere else in the country is a campaign being fought on prisoners’ rights. In 2012, Chhattisgarh’s jails were overcrowded by 253 per cent – or 14,780 inmates were crammed into cells intended for 5,850 prisoners – compared to the national average of 112 per cent, according to the Jagdalpur Legal Aid Group. From 2005 to 2012, an astonishing 95.7 per cent of all cases ended in acquittal of the accused, compared to a national average of 38.5 per cent. However, cases are increasingly taking longer to be decided and undertrials are spending more time in prisons. In 2005, nearly 75 per cent of all cases were disposed off in less than two years. By 2012, that number had fallen to 60 per cent and a significant number of cases ended after six years. On the last day of campaigning Sori feels like an examination aspirant confronted by Bastar’s vast syllabi: Her father will canvass for support in Palnar, while she will first drive 100 km east to Sukma, campaign for a few hours and then drive another 160 km dead west to Bijapur before returning to 50 km back to Geedam to spend the night with her children. Cars have been readied; in a rare display of professionalism, drivers have gone to get their stepneys checked. “Tell the drivers to hurry up,” Soni is dressed in a lilac kameez, a white dupatta, brown and black chequered cloth moccasins. She is raring to go when her cellphone rings. It’s her father, calling her 13 km away to the Madhuban hotel in Dantewada. Spies and informants of all stripes haunt the Madhuban, Dantewada’s sole motel with attached restaurant. The Maoists, police, state intelligence, central intelligence – everyone is believed to have their people employed there, a charge the staff hotly deny. Sori and her family sit in a Mahindra Bolero parked on the hotel premises and speak in whispers. Thirty minutes pass, and then an hour. Finally her father holds her close, she emerges from the vehicle and waves goodbye. Is everything ok?